Architect, formed between Italy and Germany, specialized in Landscape Architecture at the UPC-ACMA Master in Milan. She has developed professional experience and research activities related to the themes of urban resilience, mining sites and energy resources management. She has experience of team coordination in both urban and architectural fields. She has worked with Tamassociati at the project "Riforestiamo la Piana" and the competition project "H2MO" for Modena mines redevelopement. 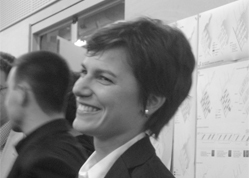 In 2009 she has joined CZstudio associati, where she has followed as project leader the preliminary studies of the Territorial and the Municipal Plan of Cubal (Angola), the research project for the regeneration of the areas facing the port mouths affected by the tides management actions (Venice); the design of the open spaces of Jesolo Lido Condominium Building (Venice) and the design of the open spaces of JW Marriot Resort in Venice, Sacca Sessola.